A well-executed portrait not only depicts a person’s physical attributes, it also captures clues that reveal their true personality. 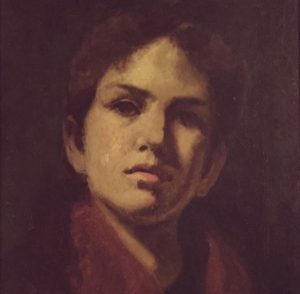 As a collector of modern portraits and figurative paintings, Michael Aaron Gallagher was also drawn to antique portraits partly for their artistic beauty and craftsmanship, but also for the appreciation of a forgotten moment in time. 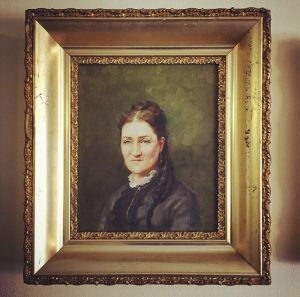 Discovered in a small antique shop in Upstate New York, where it had made its way from an old estate sale, his first antique portrait was of Medeil Huntington (born 1853), daughter of Oswego County Judge Sylvanus Huntington of Pulaski, NY. For her expressionless expression and the fact that it was one of the finest old paintings he owned at that time, he referred to it as his “Mona Lisa.” Her portrait marked a new curatorial direction in Michael’s art collection, as he moved away from acquiring decorative paintings to seeking out more serious works of art. Another Victorian era portrait from New York, whose subject also has a faint air of stoicism about her is the painting that at first reminded him of Abraham Lincoln’s wife Mary Todd Lincoln. Though the actual subject’s name is unknown, the artist’s careful brushstrokes reveal an elegant, unforgettable image. Recently, as many collectors’ interests have shifted away from antique portraits of unknown subjects by unknown artists, a decline in prices within this sector of the art market has made these paintings an affordable place to start for a beginning art collector. Michael continues to search for portraits that are unique and compelling in their own way. With each new face added to the collection, a new story is told, as bygone days and forgotten faces become the backdrop of his modern artistic vision.